GOP candidates change their debates, and White House Press Secretary Josh Earnest weighs in on Podcast for America. Can the GOP presidential contenders wrest control of their debates from their own party? 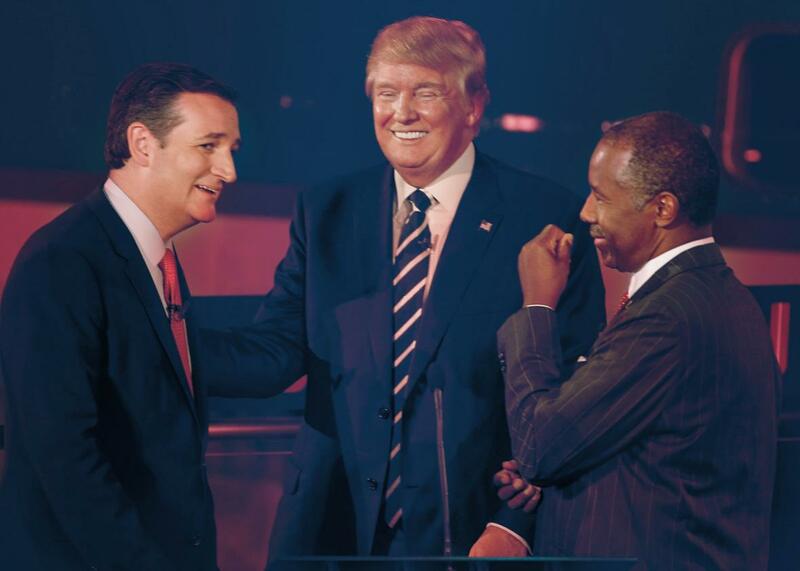 Ted Cruz, Donald Trump, and Ben Carson talk during a commercial break during the second Republican debate in Simi Valley, California, on Sept. 16, 2015. Photo illustration by Lisa Larson-Walker. Photo by Lucy Nicholson/Reuters. Podcast for America is your inside look at the courage and self-delusion that is a presidential campaign cycle. Your hosts are Annie Lowrey of New York magazine and Mark Leibovich, national correspondent for New York Times Magazine. In this edition: The big fight, which pits the candidates for the GOP presidential nomination against their own party’s machinery and the national media. Next, we’ll move into the world of commercials. Bernie Sanders announced this weekend that his campaign will roll out its first round of ads. Meanwhile Sen. Ted Cruz can’t legally get the attention of his super PACs to start cranking out commercials on his behalf. Those pesky campaign finance rules seem to be annoying his team. And finally, we check in with White House Press Secretary Josh Earnest to discuss the World Series as well as the potential pitfalls of working with new House Speaker Paul Ryan. Subscribe to Podcast for America with the links above. Let us know what you like about the show and what we should do differently.